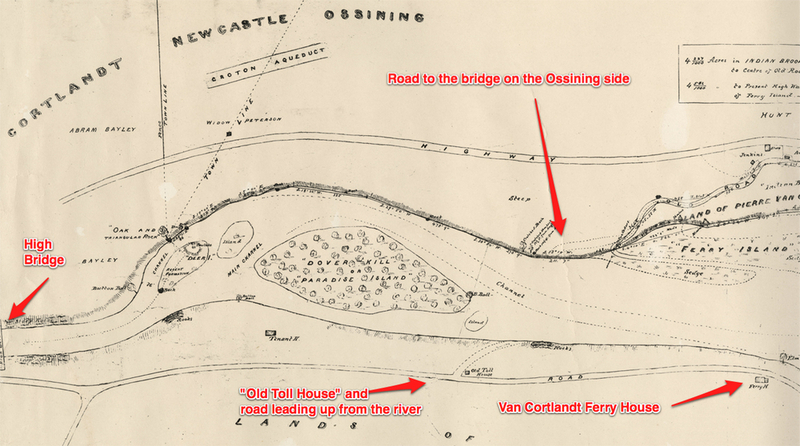 Annotated detail from the survey “The Easterly shore line of the Croton River, from Deer Island to Crawbucky Point, Ward Carpenter & Sons, 1871”. Click the images to enlarge them. Great old map for this old student of Crotonville history. The (Van Cortland) “tenant’s house” I remember as Palmer residence was likely demolished soon after Rockefeller bought Manor; Oscar Haines may have been a commercial fisherman related to fisherman Walter Haines I remember living there in 1940s; wharf shown near bridge was, in my day, “Slater’s Landing,” where land surveyor / historian Arthur Slater moored a house boat. Several other notable featuresalso shown on map.